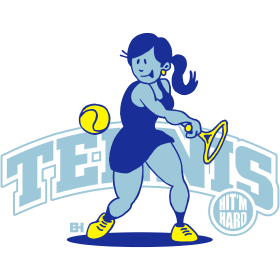 Funny three colored of a girl hitting a backhand hard on the tennis court. This design is available for on demand printing through a number of on demand printing services. You'll find these services listed on this page. Pick the printing service you like and have this design printed on T-shirts, hoodies, key chains, iPhone cases and all kind of other gifts.